Colorado Creative Industries, Office of Film, Television and Media, Grants, Small Steps Awards, Create Colorado grant, Peer Assistance Network, Public Arts in Colorado, Creative Capitol, Economic Development, cultural heritage, Folk and traditional arts, Ties That Bind toolkit, Governor?s Arts Award, Poet Laureate. 6. Reloca­ting To Net­her­lands? The Ex­pert Dutch Mo­ving Com­pany Is Here To Help /reloca­ting-to-net­her­lands-the-expert-dutch-moving-com­pany-is-.. The web server used by Coloarts.org is located in Scottsdale, USA and is run by GoDaddy.com, LLC. There are many websites run by this web server. The operator uses this server for many hosting clients. In total there are at least 2,450 websites on this server. The language of these websites is mostly english. 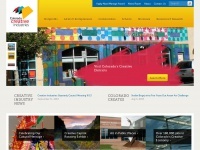 The Coloarts.org websites were developed using the programming language ASP.NET and served by a Microsoft-IIS server. The website uses the latest markup standard HTML 5. The website does not specify details about the inclusion of its content in search engines. For this reason the content will be included by search engines.